This story seems familiar, but the Edmonton Oilers are once again in the race for the number one overall pick. It’s been a disastrous year for the Oilers considering all the moves they made in the offseason to finally get out of the bottom half of the standings and they face a lot of questions as they approach the trade deadline. They already traded forward David Perron to Pittsburgh for a first-round pick and forward Rob Klinkhammer, which sends a strong message that they are fighting for a top-5 pick in the draft. Should they blow up the team even more? It seems obvious that Jeff Petry won’t re-sign with the team so it’s a forgone conclusion that he will be moved by the deadline. Does Captain Andrew Ference get traded to a contender? Do they even entertain the idea of trading star forwards Taylor Hall or Jordan Eberle? First, I want to look at what the problems are that have been troubling this team and figure out what actions need to be taken to finally catapult this team into the playoffs. What troubled this team for the last few years were lackluster possession numbers accompanied by mediocre goaltending. This year is much better than any year prior and they’re still a bottom ten possession team in the NHL. This is a good start to improving the club’s overall performance because even though they’re losing, they’re not terribly out possessed. They have had some awful luck as shown in their 97.50 PDO. What this basically shows is that they’ve been on the end of some really cold shooting and some poor goaltending. The additions of Benoit Pouliot, Mark Fayne, and Teddy Purcell have been solid and added a lot to the depth issues that the Oilers have had. However, those can only help so much when you have limited options at defense with Justin Schultz, Andrew Ference, and other UFA acquisition Nikita Nikitin. Andrew Ference is not a good enough defenseman anymore to be handling a lot of the defensive zone starts even against secondary competition. Ference would be even more exposed to this, but for most of this year he’s been paired with the team’s best defenseman Jeff Petry. For example, when Petry is paired with Ference, they control around 48% of play. That’s not great when they aren’t the teams shutdown pair, but the impact he has on the ice is astounding. When Ference is apart from Petry, he controls only 45.1% of play, which is abysmal compared to the 55.3% of play that Petry controls when he is apart from Ference. Those numbers are incredible and it is really is a testament to how important Jeff Petry is to this team on defense. The whole makeup of the defense is flawed because it’s tough to pair some of these players when you need them in certain situations to succeed. Justin Schultz has proven himself to be a liability in the defensive zone, so it’s best to shelter him in the offensive zone to get the most out of him against the lower spectrum of competition. Surprisingly, Oscar Klefbom has stepped in and been one of the team’s best defenseman controlling 50.6% of play with varying line mates and against a high quality of competition. However, Klefbom has been most effective while sheltered in the offensive zone with Schultz controlling 54% of play. But as we get closer to the deadline we get a sense of what this team should do with some of the personnel and that could mean shipping their captain off. It just doesn’t make sense for them to keep him with 2 years left on his deal and a decent cap hit of around $3.25 million dollars per year. What that chart shows using Usage Adjusted Corsi% (adjusting for Quality of Competition, Teammates, and zone starts) is that he gets the minutes of being a top pairing defenseman, but performs at the same level of bottom pairing player. It’s time to move on and get whatever you can for him from a cup contending team like Los Angeles or Pittsburgh because they have enough depth to have him as a bottom pairing player. It’s also likely that Nikitin is on his way out of Edmonton having signed a two-year $4.5 million deal to be a stopgap for guys like Oscar Klefbom, Martin Marincin, and Darnell Nurse. It is very possible he will be traded or bought out in the summer because the partnership has not been paying off for the Oilers. Now when you start to look at the forwards, they do have some depth there, but they don’t really have a good level of different types of players. This team really doesn’t have that typical power forward that goes hard to net like Wayne Simmonds or Milan Lucic. There is so much talent on this team, but they maybe should make some moves to get different types of players to add some different looks to their lines. They also are on the bad end of a very risky move to make their most recent first round draft choice their second line center. Leon Draisatil was not ready to play in the NHL and that’s on management. You need to find stopgap players to let him develop in the juniors especially because he needs to improve on a few things. There were certainly players like Derek Roy (now on team), Mike Ribeiro and Olli Jokinen available during free agency to help the team but they didn’t pull the trigger on any and they paid the price by burning a year off of Draisaitl’s entry-level contract. They are very weak at center and it seems there is no better year to add one through the draft with terrific prospects like Connor McDavid and Jack Eichel. They are in a position to add draft picks along with the two they have in the first round with guys like Ference and Petry possibly being traded. They have options where they can also trade the later first round pick for legitimate NHL depth players to add to a flawed roster. One of the team’s biggest problems has been drafting outside the first round. The only draft choice in the later rounds that has become a quality player is Jeff Petry. 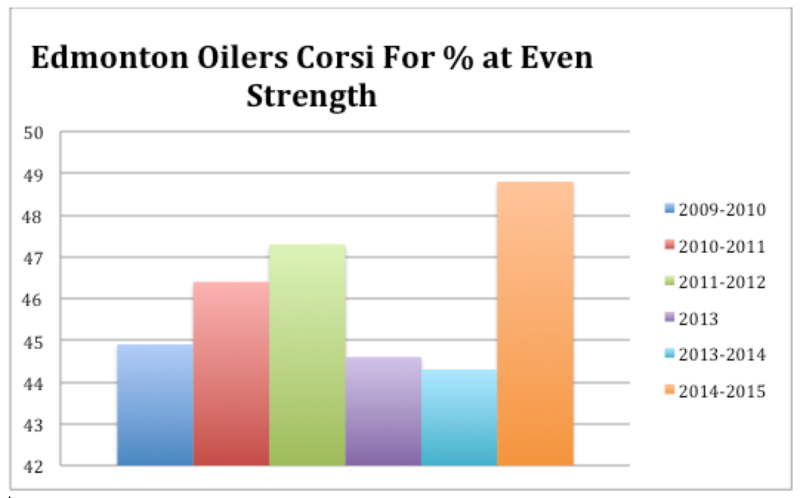 So the Oilers definitely have improved even if it is marginal. Why are they still struggling? The goaltending has been awful this year and is currently the worst in the league. They gambled on the trade additions of Ben Scrivens and Viktor Fasth last year to help stabilize the goaltending this year and those gambles have proved to be ineffective. 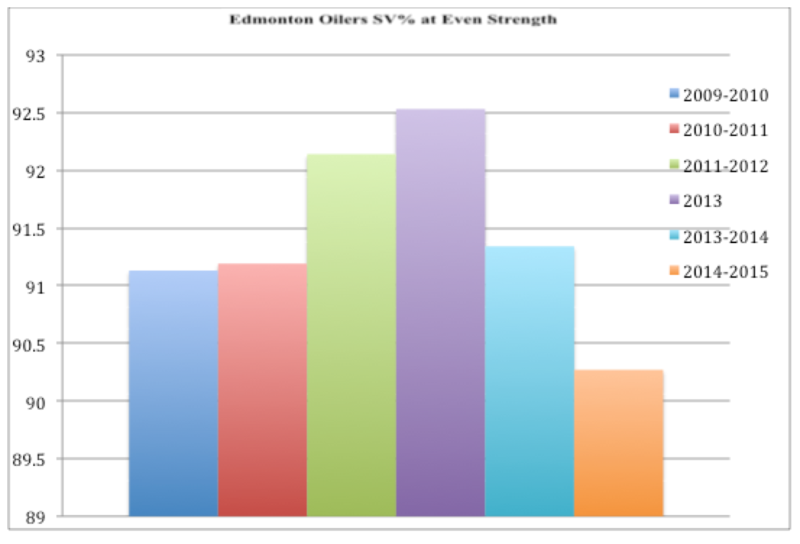 Scrivens has an even strength SV% of 90.28 and Fasth with an 89.58 SV%. Those are among the worst in the league by starters and that is an accurate representation of where the Oilers are now. Look at poor possession teams like Calgary and Toronto whose place in the standings doesn’t show how important goaltending has been for them. It’s not crazy to think that if Edmonton did have a capable starting goalie in net that they would be a bubble team for the playoffs. There are certainly options out there but one that intrigues me is James Reimer. Reimer gets shelled every time he’s out there so it would be interesting for a guy who has at least shown capabilities of being a starting goalie get a chance with a better possession team. Goalies like Robin Lehner or Martin Jones are really interesting too because they are players who haven’t really had the chance to be starting goalies yet due to being on a team with a good goalie. I would think that the Oilers will cut ties with Fasth after this year due to the fact that he is a free agent. This offseason is huge for the Oilers because it could be the last time they will be in the lottery and have assets where they need to be creative and address needs that this team has. The free agent pool this year if fairly weak but there are some fascinating names that the Oilers could be interested in looking at. Johnny Boychuk, Cody Franson, and Mike Green are all free agents after the year and the Oilers do have glaring holes at defense. All three have very good track records especially Edmonton native Johnny Boychuk, who is leading one of the top defense pairings in the league on Long Island. Oilers will have to evaluate mid season replacement head coach Todd Nelson, and there will be a nice crop of head coaches available this offseason. Patience is key because this team really has made some costly mistakes, but there is still reason to be optimistic about the Oilers and their group of highly skilled forwards. All it takes is some creativity to help this team over the hump and back to being a playoff contender.